We're working to get another batch made soon, feel free to contact us to have your name added to the waiting list. The Chip Maestro is a unique cartridge for the original Nintendo Entertainment System. 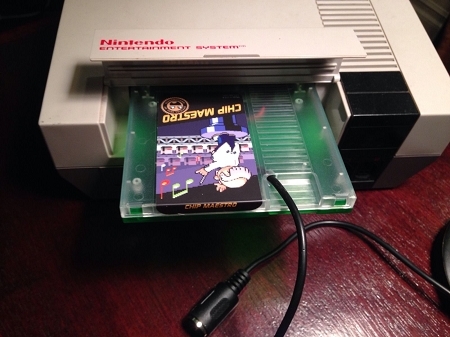 Simply insert it into your NES, plug a MIDI keyboard into the MIDI input on the Chip Maestro and connect the audio output on the NES to any speaker or television. That's it! Now you can enjoy the true sounds of the NES!!! 1. 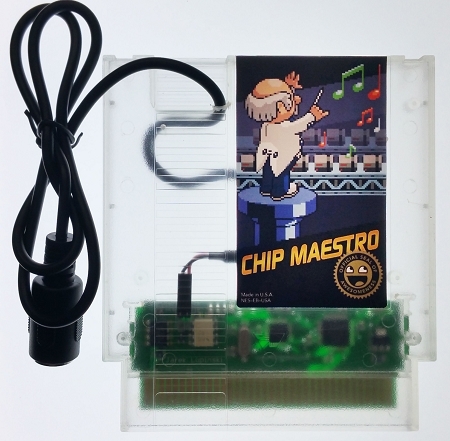 The Chip Maestro is programmed for NTSC versions of the NES, it will not work correctly with PAL versions! 2. You must disable the MIDI sync/clock signal on your keyboard or use one that does not send this signal; if you cannot do this the Chip Maestro will not work correctly! The Chip Maestro is fully programmable via your keyboard and allows you to change many parameters to dial in the sounds you want to hear. Each of the four standard channels of the NES audio processing unit can be played simultaneously! A manual, quick-reference guide and instructional videos are available online to walk you through all of the options that can be changed to get the classic chip sounds we all know and love. You will be in control of the 2 Pulse (square) waves, the Triangle wave and the Noise channel allowing you to compose true 8-bit symphonies. You can play the classics that we love so much or compose your own. 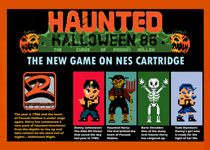 You will soon be playing the NES like never before! !